Introducing the definitive resource designed for practitioners working in the rapidly expanding area of moderate procedural sedation and analgesia clinical practice. 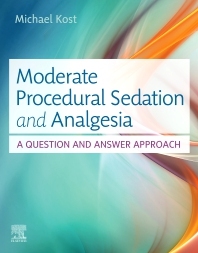 Moderate Procedural Sedation and Analgesia: A Question and Answer Approach focuses on the preprocedural, procedural, and postprocedural care of the moderately sedated patient in a variety of settings. This comprehensive text is designed to provide all the content and tools nurses and other clinicians need to demonstrate competency in moderate sedation and analgesia. Additionally, this user-friendly text is written by well-known sedation/analgesia expert, Michael Kost and recommended by standards of practice from the ANA, AORN, and the American Academy of Pediatrics. New clinically focused text ensures clinicians involved in the administration and management of patients receiving moderate sedation have access to the most up-to-date information. Strong safety focus throughout the book explains how technology and clinician practice can improve sedation administration. Chapters organized in clinical problem/question plus answer format help you easily comprehend material. Follows the latest TJC Sedation/Anesthesia Guidelines ensuring you are ready for medication administration in clinical practice. Pediatrics and Geriatrics chapters cover specific sedation practice recommendations that address the substantive clinical practice challenges associated with these patient populations. Pharmacologic profiles of medications detail their use in the moderate sedation practice setting.